Aside from ALS-Basic Literary Program, another program is opened for the out-of-school youths (OSYs) in Barangay Balabag, La Carlota City for their education, for their ntrepreneurship, and for their employment as Abot-Alam program of the Department of Education DepEd was launched at the hall of the Barangay. 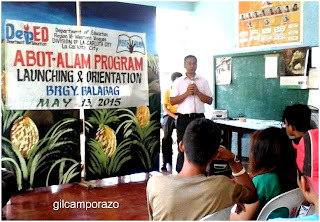 This DepED thrust, Abot-Alam, targets a Zero OSY Philippines by 2016. This is the reason why the government continues to provide all Filipinos access to quality education and so that no learner is left behind. These OSYs may have the opportunity to enroll to different programs and opportunities of Abot-Alam for education, employment, and entrepreneurship as mentioned for a certain period of informal schooling. La Carlota ALS EPS Avelino N. Santillan explained to the Abot-Alam learners how could be helped by this program. He further said that the OSYs be provided with education through the Alternative Learning System (ALS) of DepEd and its partners, skills training and employment through TESDA and partner companies, and entrepreneurship opportunities. Punong Barangay Joel Rumbines in his opening remarks lauded the efforts of ALS mobile teachers and Instructional Managers in mapping out these OSYs who live in nearby place of Barangay Balabag like Hda. Remedios and the proper of the Barangay. He was very satisfied of their willingness and determination to grab these opportunities. His council member like Rolly Estillolos, Susanita Pilar and Emma Solis were very supportive for this kind of educational project by the government, especially under the program of ALS. Now, these OSYs were already informed of the opportunities they may get from this Abot-Alam program. The school principal of Balabag Elementary School, Gil Camporazo shared with them an inspiration what to do practically in indulging this educational opportunity which couldn't be done in a formal educational as offered by a complete basic elementary and secondary school. 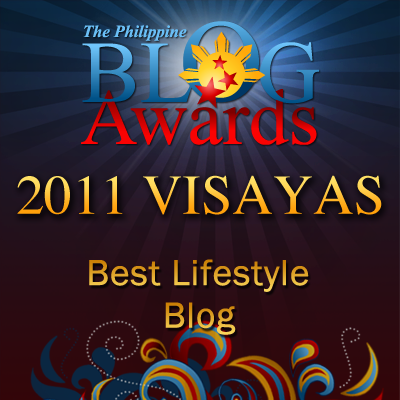 First, he told them to be grateful for what they have in stored for them by being prayerful. As what the scripture points out in acronym of ASK. Thus, they should ask for it shall be given them. They seek for it shall find. And they knock for it shall be opened. Then he relayed his actual experiences on this matter while he was working as a Church custodian of the Mormons Church and as a school principal of Cubay Elementary School before that he had helped a little creature to get out from a situation behind their capacity to do it. Thus, he connected it with what these OSYs are experiencing why they need such help for their incapacity to do it because of circumstances beyond their control. Then, he finally challenged them on how to prepare themselves in order to find success in this informal education endeavor offered them by the DepEd. He again pointed out in another acronym of ACT. First is attitude. One hundred (100) percent of attitude for determination to complete their study is needed no more, no less. Then, communication is a must. Any queries, problems they may encounter, they shouldn't hesitate to ask for assistance, to tell their teachers for their problem or whatever they don't understand especially in completing their short course of study. And finally, time is precious. Time lost is never gained. But time properly used is gold. Proper keeping of schedule is nearing to a perfect completion of their study. 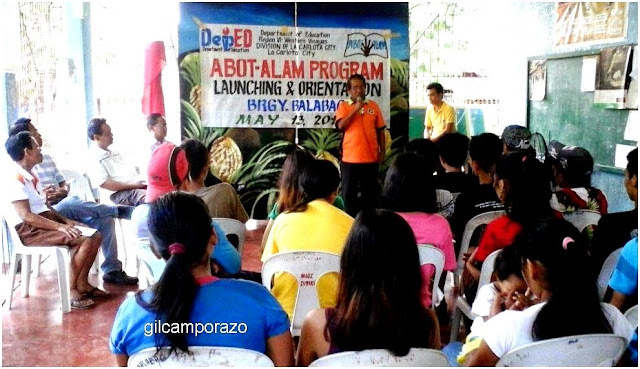 Fifty-five OSYs had initially signified their intention by committing themselves to avail of this Abot-Alam program of the DepEd as facilitated by ALS aside from Basic Literacy Program and Acceleration & Equivalency Test. 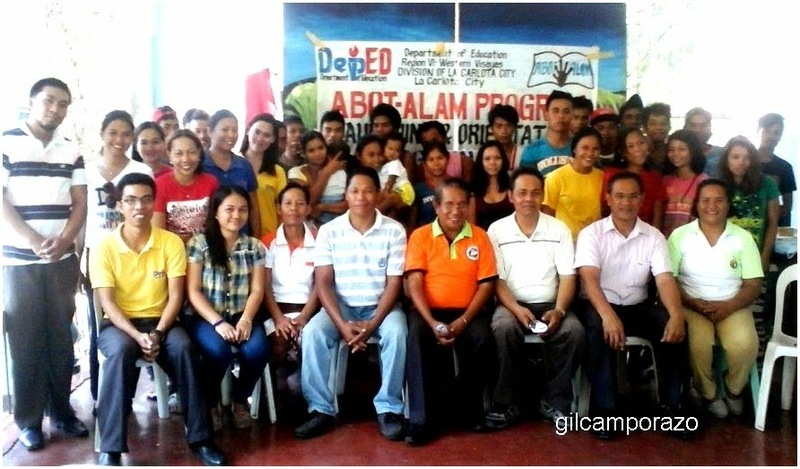 Ms. Joe Ann T. Martisano as a Literacy Volunteer of Abot-Alam Program will handle the two separate classes; one in Hda. Remedios and one in Barangay Balabag proper.